How Can You Stop Climate Change? Fortunately, there are many ways we can stop climate change. In a nut shell, we need to reduce our carbon footprint which is the total set of greenhouse gas (GHG) emissions we personally cause. Often, when considering someone's carbon footprint, it is usually in terms of the amount of carbon dioxide they directly or indirectly produce. In this page, you have the opportunity to write your own article about how to reduce your carbon footprint. We can reduce our carbon footprint by reducing our consumption of fossil fuels. This can be done by having a car with better fuel economy or simply getting a hybrid, electric or hydrogen fuel cell car. Moreover, we can simply take public transit, bike more or walk more. This is of course good for our health as well. In addition, we can always offset our emissions by doing acts such as tree planting (also known as reforestation). The reality is that trees produce oxygen and reduce carbon dioxide in the atmosphere (they even moderate ground temperatures). For this reason, tree planting is a very popular method of reducing one's carbon footprint. Moreover, we need to conserve our energy. In other words, we need to use energy more efficiently and only use it if we need to. How can we do this? We could have more efficient appliances that have a good Energy Star rating. Also, we could use more efficient light bulbs. We can buy food locally and organic food as well (or both). This is known as a low carbon diet and it not only promotes your health but supports local economies as well. We could reduce our meat consumption and eat more plant-based foods. Large amounts of carbon dioxide are released as a result of the meat industry. This is mainly done through the deforestation of forests in order to create livestock fields, producing the meat itself and transporting it. Switching to mainly plant-based diet is good for our own health as much as it is for the planet. Of course, recycling is a great way of helping the environment. 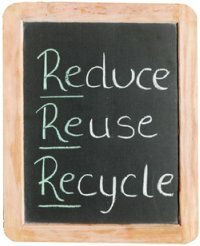 Also, reducing and reusing goods is another way you can help build a sustainable future. In fact, by reducing the amount of goods you consume, you could have a cleaner and more organized home. This will cause you to have less stress and a healthier lifestyle. Composting is a great way of helping local farms and gardens while preventing global warming. In fact, compost can be rich in nutrients and is used in landscaping as well. It is also important for organic farming. What we choose to buy is what we choose to support. For instance, if a company takes advantage of workers in developing countries and we buy their product, we are supporting their immoral actions. Similarly, if a company obtains their product without ensuring that they do not destabilize the environment, we are supporting them by purchasing their goods. Essentially, a purchase is like a vote. Speaking of voting, if a political party does not make climate change one of its top priorities, we should not vote for them. Moreover, we need to send letters to our local governments asking them to take more action. Needless to say, we should give organizations that are trying to stop climate change our full support. If there isn't a green team in your school or a composting service in your city, do your part in creating one. It is also crucial that environmentalists stay connected via social media so that they can easily unite for petitions, protests, and the like. We need to share information about our planetary crisis. We need to tell our friends and family to reduce their carbon footprint and thus stop climate change. For those of us living in industrialized countries, we need to raise our voices. The truth is that we take our freedom of speech for granted while citizens of developing nations suffer from global warming in silence. Global warming has been at the backburner of politics and the mass media for far too long. We need to turn things around for as they say, good planets are hard to find. In sum, there are many ways in which we could help stop climate change. It is time for decisive action. Below are great contributions from my visitors who offer advice on how to live a more carbon neutral life. Do you know other ways to help the environment? Do you have a story about how you reduced your carbon footprint? Please share! What if it's ALL a HOAX! At 43 years old I have never driven a car!